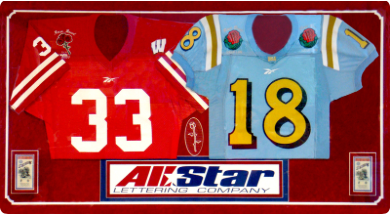 Perhaps you’re not familiar with All Star Lettering, but since 1969 we have met the needs of a fast-growing, dynamic Southern California athletic industry, and we’ve become an industry leader in custom contract athletic uniform decoration. We’ve been the ones behind the scenes helping to make your squad look sharp with our first quality team lettering and garment decoration services. Our decorations have been featured on the uniforms of elite athletes and teams in the biggest football game, to collegiate championships, to youth ball and everything in between, all over America. Customer satisfaction is achieved repeatedly because of our dedicated and loyal work force, whose common goal is to deliver the goods on time at the highest level of quality. We accomplish this through production efficiencies gained through years of valuable experience by our decorating professionals. We pride ourselves on coordinating the myriad of details required to create a well-decorated uniform, in a just in time environment. Featuring an in house art department, team apparel screen printing specialists, tackle twill department, embroidery services and cut & sew sublimation. We are delighted to know that when a customer opens a carton of decorated uniforms from All Star Lettering, it results in smiles on the faces of equipment managers, coaches and athletes alike, young and old. We look forward to many more successful on field outcomes in the years to come. In the end, at All Star Lettering it doesn’t matter whether you win or lose; it’s how you look while playing the game!